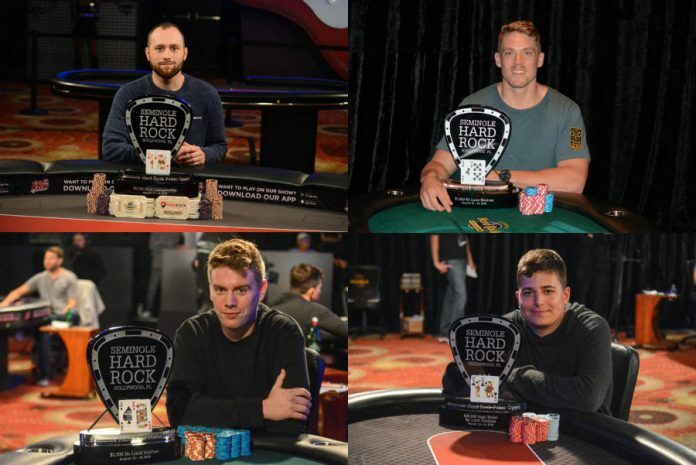 South Florida has been the hot spot for poker over the past few weeks with the Seminole Hard Rock Poker Open attracting some of the best players in the world and an impressive amount of local players. All of that action wrapped up on Tuesday with the Big 4 final tables all streamed live on Twitch thanks to Poker Night in America. Brandon Eisen topped the 914 entries in the $5,250 Championship event to win $771,444 and his first live win since taking down a $200 Deep Stack Extravaganza event in February 2013. He beat out a final table that included Joseph Cheong, Jared Griener, Ryan D’Angelo and eventual runner-up Jeremy Ausmus. One of the hottest tournament players on the planet, Alex Foxen, successfully defended his title in the $2,650 No Limit Hold’em event by beating Blair Hinkle heads-up. Along with Hinkle, the final table included Jake Schwartz, Brandon Hall and Michael Esposito. The win earned Foxen $208,452 – just $3,852 more than he earned for winning the same event last August. In 2018 alone, Foxen has now picked up four wins and just over $2.3 million in earnings. Marc MacDonnell beat Joey Coudon heads-up to win the smallest buy-in event of the Big 4, the $1,100 No Limit Hold’em event, earning $119,465 in the process. The event drew 640 players including Maria Ho, Chance Kornuth, Marvin Rettenmaier, former #1-ranked Kevin Saul, Phillip Hui and Mike Leah. The biggest winner of the day was Jake Schindler. The Pennsylvania poker pro picked up $800,758 for beating Shaun Deeb heads-up in the $25,500 High Roller event. There were 123 entries in the event and among the 16 players who made it into the money were Ryan Riess, Darren Elias, Chris Hunichen, David Peters and Tom Marchese. Schindler’s win is his seventh of 2018 and moved him within past Sam Trickett for 17th on poker’s all-time earnings list. Deeb meanwhile crossed the $3,000,000 earnings mark for the year after bringing home $534,989 for his second-place result.